January 29, 2016 By Elise 24 Comments This post may contain affiliate links. Please read my disclosure policy for more info. It’s easy to look back over the last several years, and think if only I’d done this or that, we would have been a lot better off a lot sooner. I’m sure that anyone would have thought we were crazy a few years ago when we didn’t have any money, and maybe on some levels, I would have been smarter to just get a job rather than be so determined to stay home with my kids! But we did eke it out. We stuck with our determination to make a living from home, we went through some serious rough patches, but we made it. 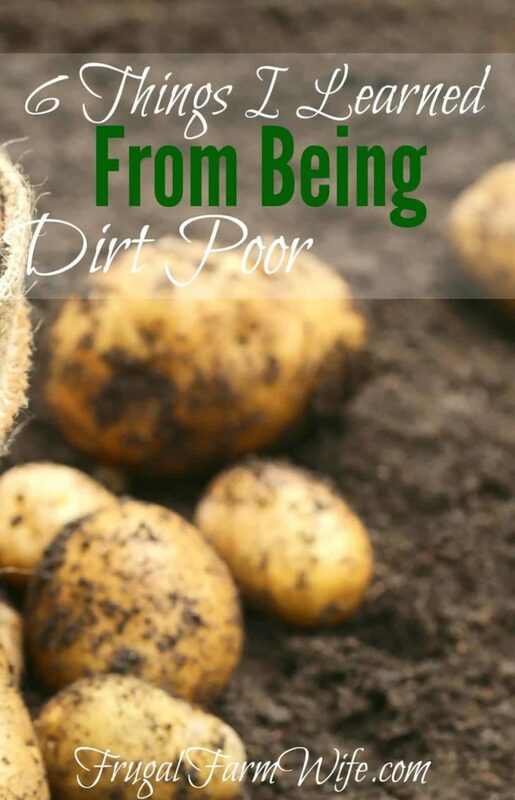 People think I’m exaggerating when I say we were dirt poor, because we look alright from the outside – just maybe a little bit anti-social. But the truth is, we had a roof over our heads only because of the graciousness of our landlords allowing us to delay our rent payment. We weren’t anti-social, we couldn’t afford to drive our car. And you know what? I wouldn’t trade the lessons those experiences taught me for the world! Money isn’t the answer to everything. Money can buy things, but it can’t buy experience, and it can’t buy character. Happiness is a choice you make. 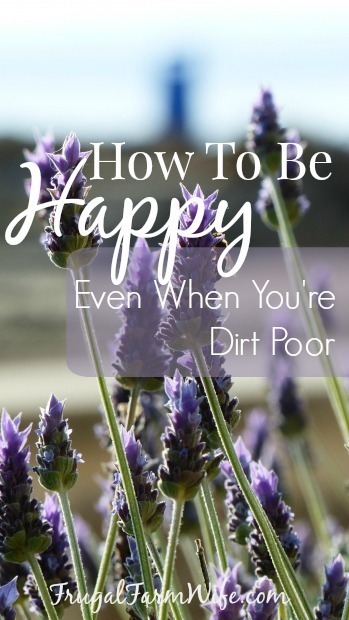 Yes, you can be happy – even when you’re dirt poor. I’m ashamed that it took me so long to learn that lesson, but I can at least confidently say that I never would have learned that happiness is not based in material wealth if we hadn’t been so broke for so long. It truly is a gift from God. You can work really hard. I thought I knew how to work, but then we went broke, and had kids. Between having a toddler, being pregnant (and then mom to a newborn), growing as much food as we could, trying to help my family out when we lost our mom, and trying to build a business, I finally learned work ethic for real. My former, pre-pregnant self is a little ashamed of how hard my pregnant self could work (let’s not even get started on my teenaged self!). You don’t have to spend money. 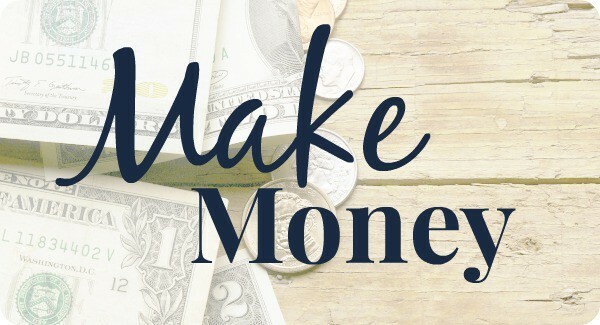 This is really important, because if you have a spending problem, making more money won’t fix it – it will only grow with every paycheck. I’ve always believed that it was my duty to wisely steward the gifts God has given me, but now I realize that my stewardship always has room for improvement. Good food doesn’t actually cost a lot. 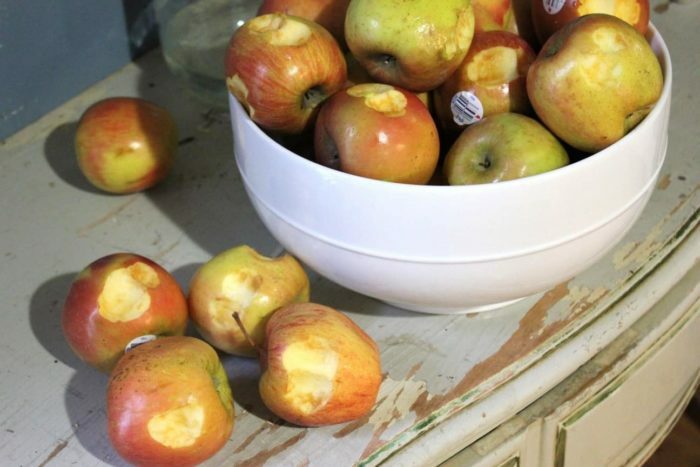 Spending $20 a week on groceries was a luxury, and we learned to eat, and eat well, (or less) for the whole family. My cooking skills were forced to improve as we got creative with less expensive food (and FYI, tempeh tacos are actually really good! ), and find free food where we could. You can make more things from scratch than you think you can. 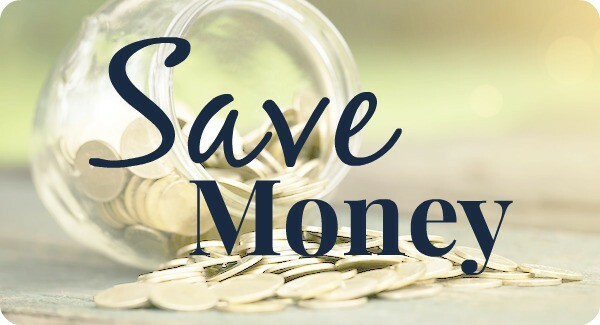 You’ll be really surprised how many things you can make from scratch to save money. From the afore mentioned tempeh, to homemade body products. Not only are they cheaper, but they’re much more healthy! 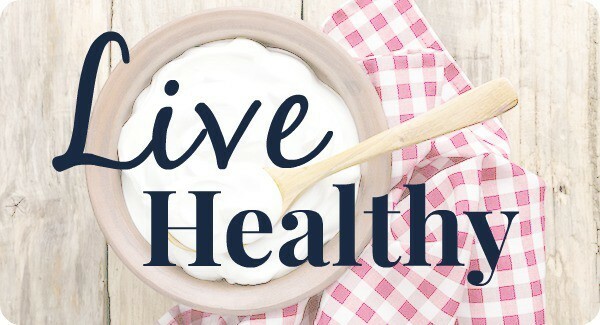 You don’t have to be rich to live a healthy lifestyle. 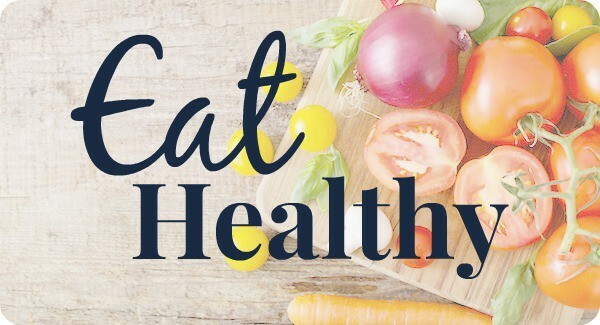 Fitness and good food don’t have to cost a fortune. Despite our meager food budget, we managed to eat well using tactics like buying frozen produce over fresh, cooking dried beans instead of buying canned, and hunting deer in the fall and winter. We set up a weight rack under our car port, which was a tremendous help in staying fit, and as a chronic outdoor runner, I find gyms boring. So even though we couldn’t have afforded a gym membership if we had wanted one, we didn’t need it, and still managed to stay very active. Above all, I think experience with poverty gave us the ability to live apart from our wealth (or lack thereof). We don’t so much view money as an all-consuming need now. Earlier this year, I was offered a job that would have almost doubled our income. I knew the hours would work around Gabriel’s, so baby sitting wasn’t an issue, but the fact is, I want to be home with my kids. So I said no. I’m earning enough money as a stay-at-home mom right now, and if God sees fit, He’s welcome to increase those earnings, but because I know that I can crunch my budget down to almost nothing, I can say “no” to that job offer, and stay home for my kids with confidence. Because the most important lesson I’ve learned from being poor is that I am not my money. 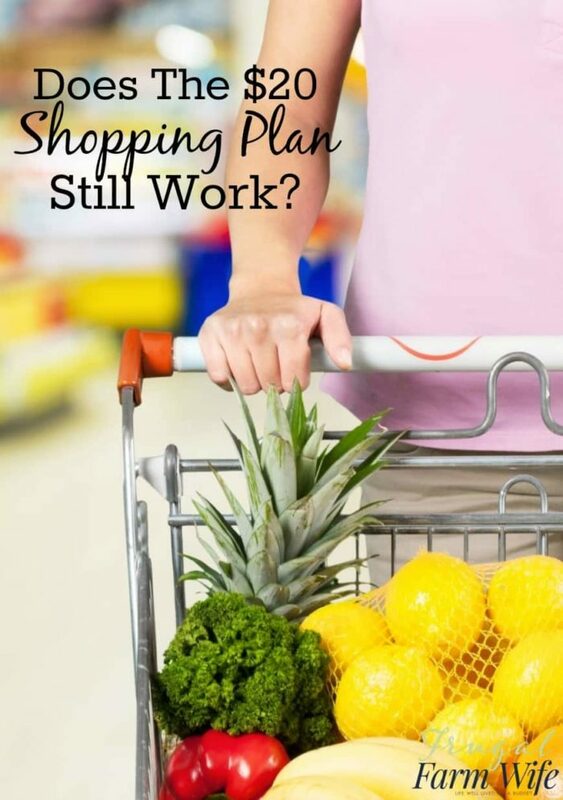 Does the $20 Shopping Plan Still Work? I understand that you’ve accomplished a lot and your hard work is awesome. But if you are poor and cannot afford to feed you family. If you are living off the charities of others. If you are a burden to others. What are you really teaching your children? That you do not have to work because we can live off of others generosity. We can make people feel sorry for us and manipulate others and get what we want without having to work. If you are poor than you do not have the luxury of being a stay at home mom. You should be responsible, go to work and provide a decent living for your children. How many women would love to stay home with their children but can not afford to do so because they are poor? Why are you special? You children will learn more when they are shown that working and making sacrifices is what will get you ahead. We can not have our cake and eat it too. Do not get me wrong I would have loved to stay home with my son but we couldn’t afford that. I did not want my son to do without. I did what some many other courageous woman do: I went to work. I gave my son a better life. He watched me work hard to provide him with a decent life and he respected me for it. He watched me get promotions and pay raises. He watch our life improve because I went to work. Now he does the same for his child. It’s simple if you are poor you have to work. I’ve been there and done that. Childcare costs are expensive and can cost just as much as you make. There have been a couple times in my life that it wasn’t worth it to work and have my kids in childcare. One time when I was a single mom to 2 kids, I made .10 cents an hour more than I paid the babysitter. Add in gas and the drive time to and from work, I paid the babysitter more than I made. 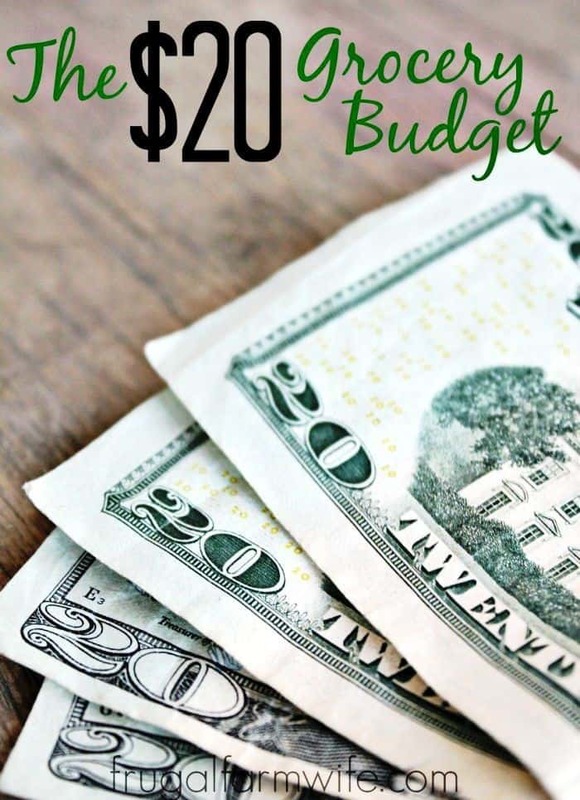 Another time, I brought home $200 a month after paying daycare. But I definitely spent that in gas a month driving to and from. Basically broke even, I worked full time and was away from my girls 40+ hours a week for nothing. Then add in vehicle maintenance, insurance, registration for that second vehicle. …. mom getting a job isn’t always the answer. I’ve walked where you walk and have never regretted staying at home. We saw our income level, though it stayed pretty constant, drop below the poverty line. My four kids are all over 25 and successfully following their dreams. Loving what they do and able to support themselves. Two have college degrees. One is planning on graduate school in a couple of years. Two have found wonderful life partners. They actually are grateful they didn’t have a lot growing up. The lack of technology gave great room to their imaginations and artistic inclinations. And do these people know how to find a bargain! I thank The Lord he let me be their Mama.